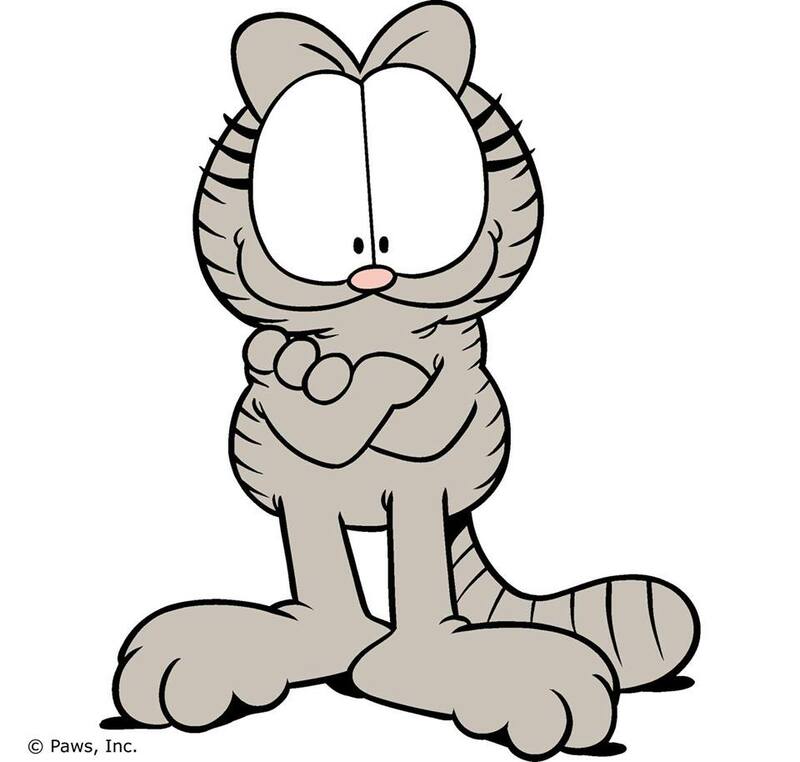 Do you remember Nermal, that cute little cat from Garfield? Such a cute and vain kitty he was, he really did annoy Garfield. Well, who could resist him? When I saw this camera for the first time, it reminded me a lot of Nermal, it is a really cute camera, that small… and with the looks of a Leica M.
Garfield was so jealous about him (Nermal) that he wanted to send him to Abu Dhabi… well, I don´t know about Nermal but I would not ship the CM to Abu Dhabi because in fact, Abu Dhabi is not that bad so,… I would rather send the Leica CM to Borkou or Siberia. I mean, that´s what I felt about the camera the day after I bought it. 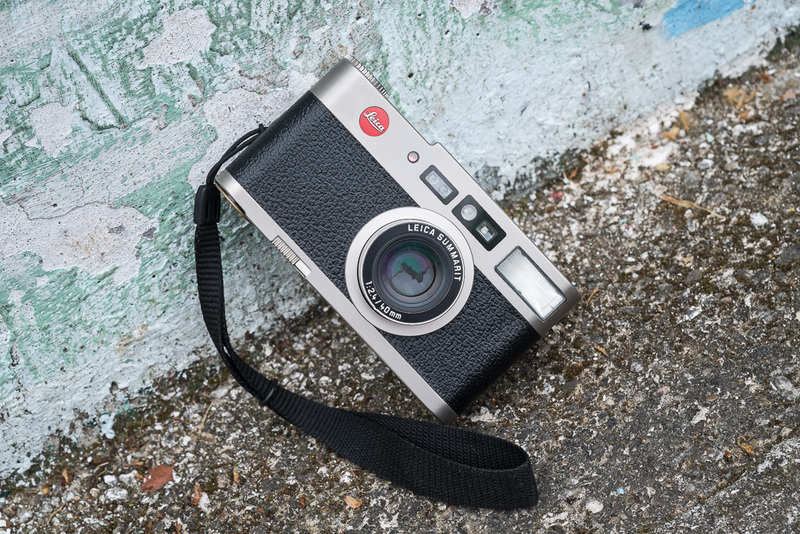 I did read a lot about the CM before I purchased one and I learned that it is a evolution of the previous Leica Minilux with better flash capabilities, improved optical coatings, hot shoe… and a more reliable design fitted into a titanium body. Well, Perfect! Mind you, that amazing 40mm f2.4 Summarit lens is blazing sharp, comparable in quality to the Leica M lenses and fitted to a very compact body. So what´s wrong? 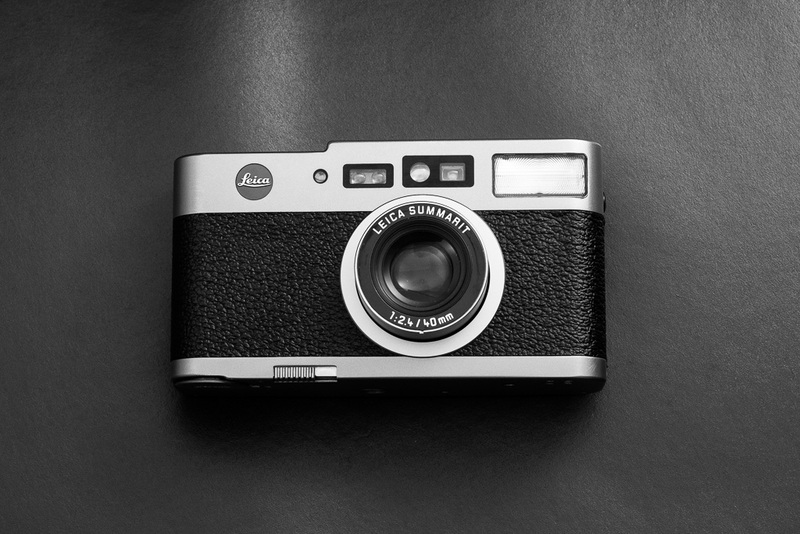 If you search the internet you will find out that the Leica Minilux is doomed by shutter problems mainly caused by a soft cable that links the camera to the shutter mechanism, this cable will eventually brake turning the camera into a nice paperweight. 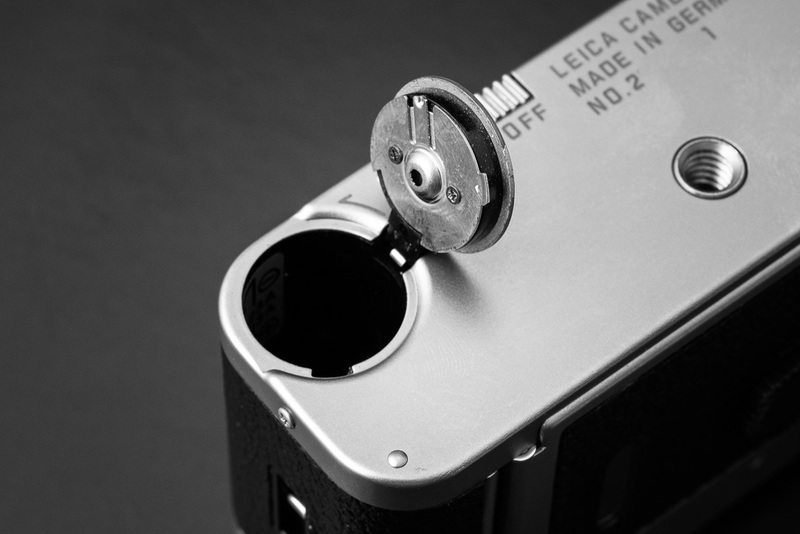 In various forums you will read that the best option is to get the Leica CM because such issues have been solved. Right? Well, no. Before I purchased mine I did test it and everything was ok, so I put a roll on it, made some shots and went home as a happy owner. The next day I was playing with it and after 10 shots the diaphragm got jammed at f5.6 and then at f22, it would not move! Later it totally broke and the EI shut01 error appeared on the LCD. So I called Leica services the next day and to my disgrace they said that due to the lack of repair parts, they do not service the Leica CM anymore. For a camera released in 2004 and sold up to 2006 that is shocking! So, if you now are considering the Leica Minilux instead, let me warn you that it is also, not serviceable by Leica. Well, the review could stop here but thankfully for us owners of the either the Minilux or Leica CM there is a solution! One of the last pictures I made with the camera before it broke. 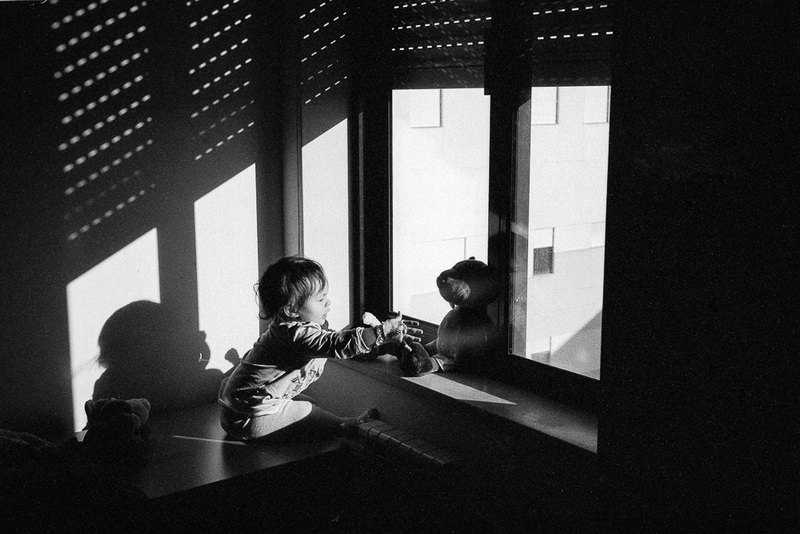 Focus is not spot on, but at f2.4 it is hard to nail it when the subject is a moving child. Leica CM & Expired Fuji C100. In my case I took the camera to Fototecnica repair centre in Oporto and after explaining the situation to the technician, he just smiled and went in with the kitty. After 5 minutes he came out and said I should leave the camera, he had already repaired several Miniluxes by replacing the soft cable with a new DIY one. To my surprise he phoned me the next day and said I could pick up the repaired camera! 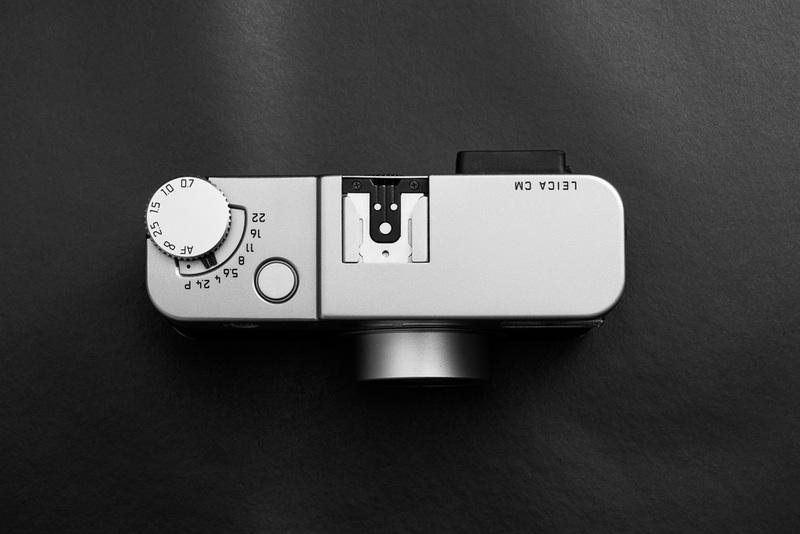 I think this is the most relevant information I can give about the Leica CM or the Minilux, because if you have it or consider the purchase of one, there is hope that it may be repairable if you get into problems and believe me, sooner or later you will. 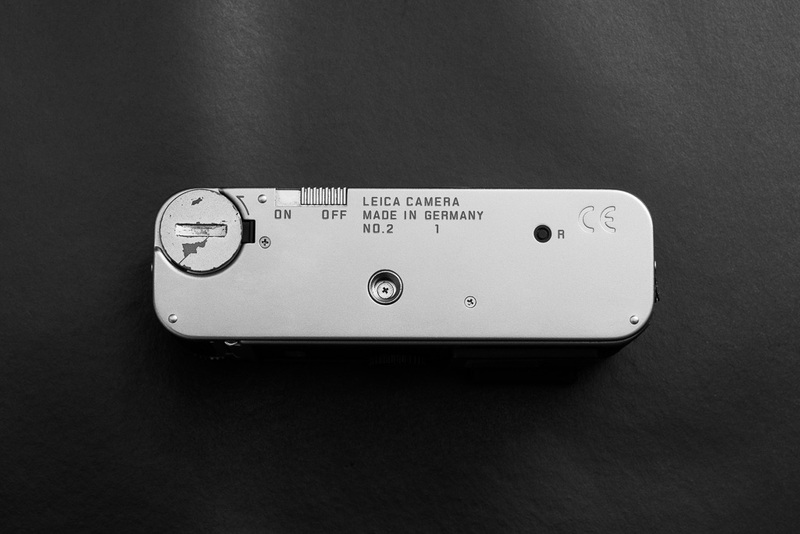 Leica CM front view in off position. look to the bottom of the camera, to the left is the on/off button. And now in the on position, the lens will pop out. 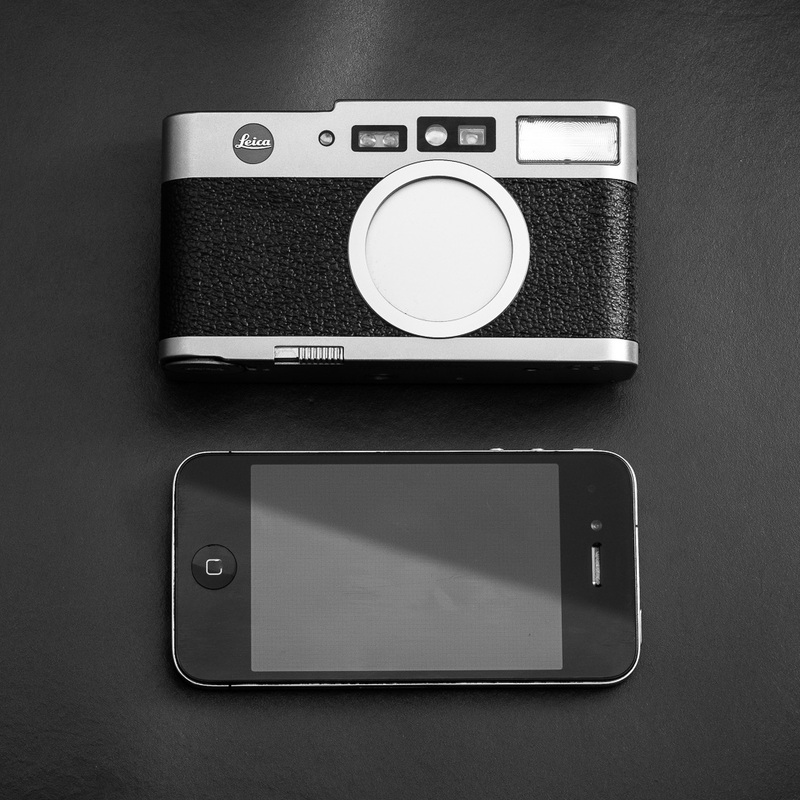 Leica CM size compared to the iphone 4. 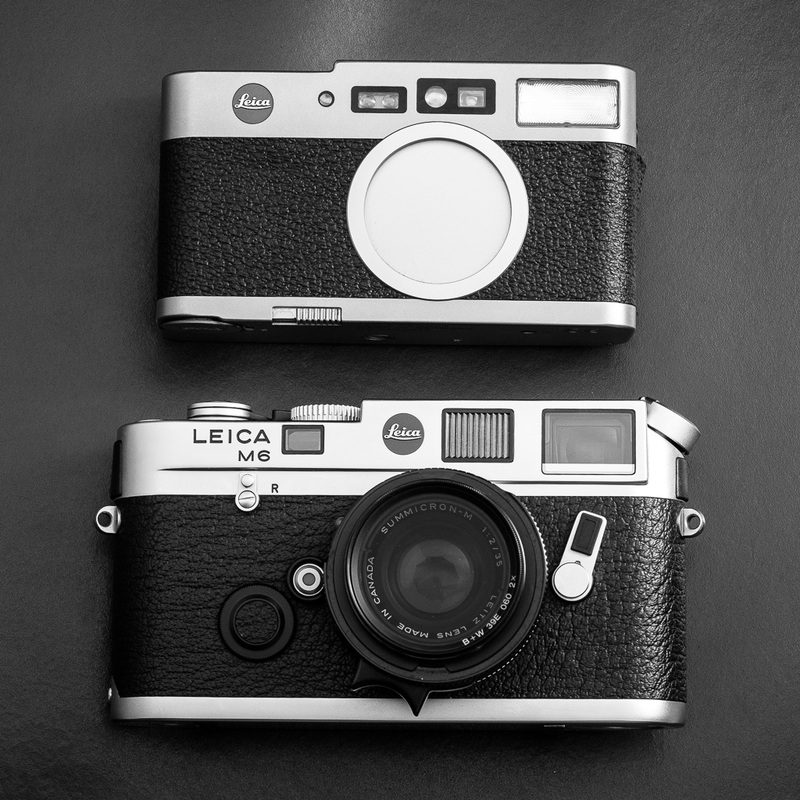 And here compared to the Leica M6. 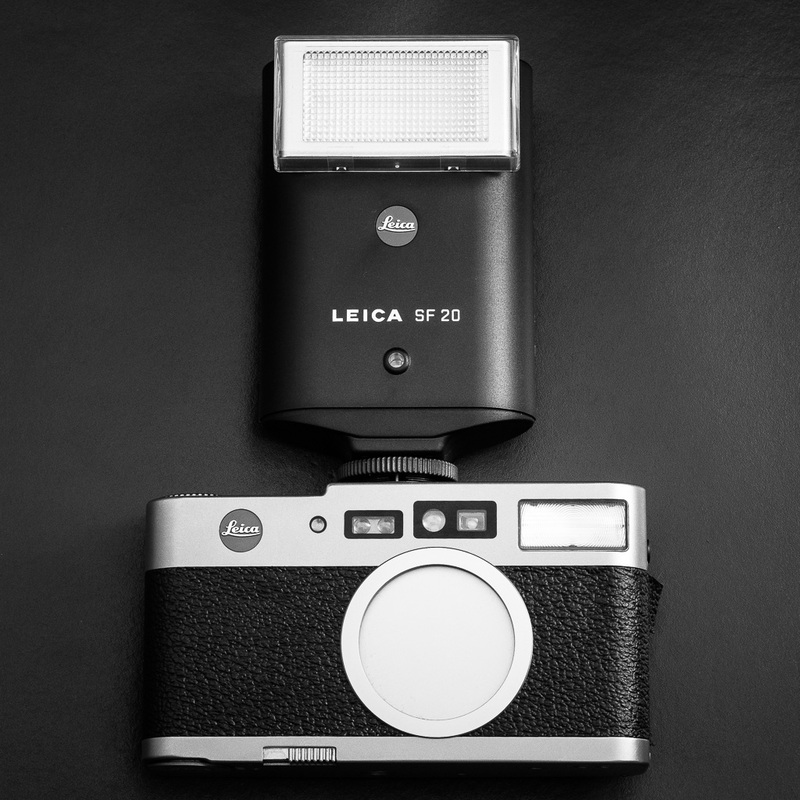 Mind you, the new Leica M typ 240 is even larger. With that said, we can enter the second part of this review where I will talk about the usability of the camera itself and about it’s characteristics. 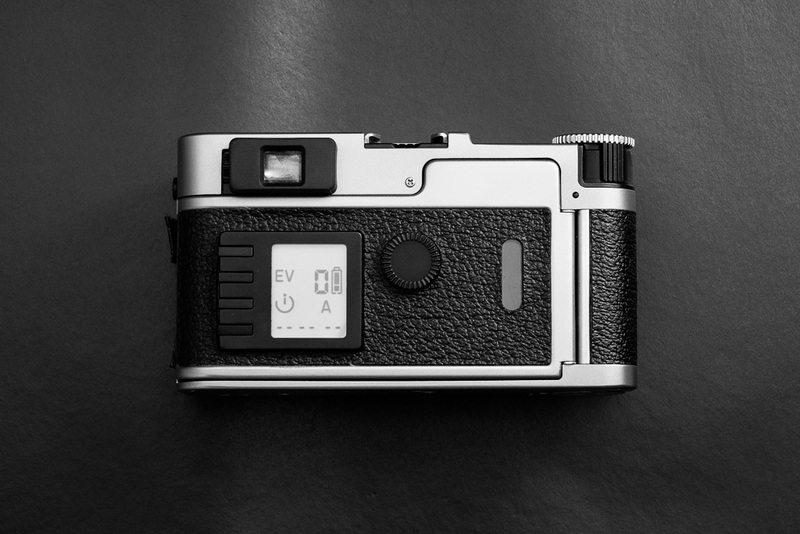 Probably you already read some reviews about the CM, I also did and one can find extensive information about the camera and about it’s counterparts, mainly the Contax T2 and the Ricoh GR1. I did briefly play with a Contax T2 and I must agree that overall it is a better camera, more compact, robust and more important than that, a mechanical diaphragm selector. A view from the top. To the left there is the focus dial and the diaphragm selector. Next to it, the two step shutter release button. At the center we have a flash hot shoe, something the Minilux does not. And here, the bottom plate of the camera. If you have noticed, the camera is completely mint except for the battery door compartment. 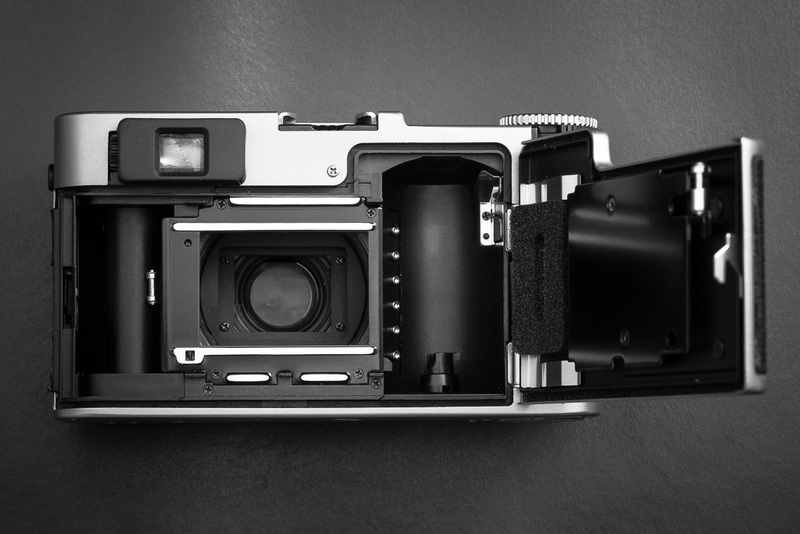 Yes, the CM looks robust and if you open the film door you will see that it is in fact very well built with few plastic parts but to my eyes it seems that not all parts of the camera where thought to the same level of excellence. For instance, the titanium body looks and is in fact very solid but if you look at the battery door closely you will find out that it is made of a weaker metal, faux painted to resemble titanium but worse than that, the door assembly has lots of plastic parts that eventually may be a source of problems. Plus, I don’t understand why there is a screw drive inlet if one can open or close the battery door with one finger. Turns out that one sales vendor used a coin to open the battery door of my camera and in the process the paint started peeling of – a real shame. The battery door assemble is mainly made of plastic with a faux painted cover to resemble titanium. The film compartment is nicely finished and the most obvious detail is that the film goes on the right side of the camera. But the most notorious fault to the camera is obviously the leatherette, of good quality of course, but the way it is placed on the camera makes it easy to peel off. When I had my CM repaired, the technician was kind enough to glue it back into place, from then a few weeks have past and I can see that it is peeling off again. Nothing serious but it is there. The metal underneath the leatherette is amazingly polished, should this be the cause of the leatherette pealing? The lack of a textured surface for the glue to stick on to. Then we have the LCD on the back with some quirky buttons and a dial that obviously is not the most practical solution but for such a small camera I think it does the job by offering lots of shooting possibilities one can only find on professional cameras, like flash sync to the second curtain and AE shift up to 2 stops. Unfortunately, no ISO override, meaning, if you use a film without DX code like the marvelous Adox CMS20, there is no way to setup the ISO that will be set by default to ISO 100 and with only 2 stops of AE shift available, the closest one can get to is ISo 25. On the rear, from top to bottom, the selector buttons for flash, exposure override, shutter timer and hour/date imprint. Next to it the dial selector. Also, notice that there is a diopter selector for the viewfinder and a film window! Not all is bad though, fortunately this menu system hides a secret that professional photographers will love to know, if you press any button for some seconds with the options you selected, it will store them in memory so that the next time one turns on the camera it still remembers that you don´t want to use the flash for example, or that you are over or under exposing. Other source of problems is the speed and auto-focus/manual-focus selector.They are well placed together and it’s a very clever solution indeed, but the focus dial moves very easily out of position and when one tries to change the diaphragm value, he may end up with the camera in manual-focus or with the focus distance accidentally changed. I have lost some shots because of this. I cannot end the list of cons without some words about the time it takes to rewind the film because it is really slow so, if you’re taking the camera to a important event, make sure the film does not end at the middle of a ceremony because you will loose the rest of it. And here the small Leica flash SF20 mounted on the camera, it makes it look even smaller! Mind you, the external flash for some reason will not work in TTL mode but still, works just as fine in automatic mode since it will read from the camera the shutter speed, f stop and subject distance. So after all these complains one may think I don’t like the camera but it’s quite the opposite, in fact I love it! Definitely a camera Mummy would bring to the kinder-garden but also a camera Dad would love to have. To start with, no arguments against that marvelous Summarit 40mm f2.4 lens. Maybe the new digital Leica compact cameras like the X1 and X2, cannot get a compact lens of such a quality because digital sensors restrict the use of such lenses, otherwise I don´t see why they would not use this lens on the new cameras. 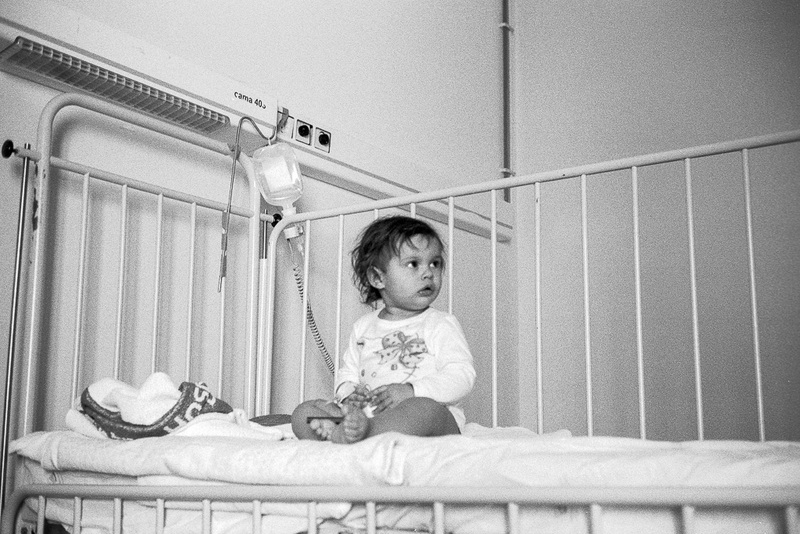 It is one of the sharpest lens I have ever experienced on a 35mm camera. 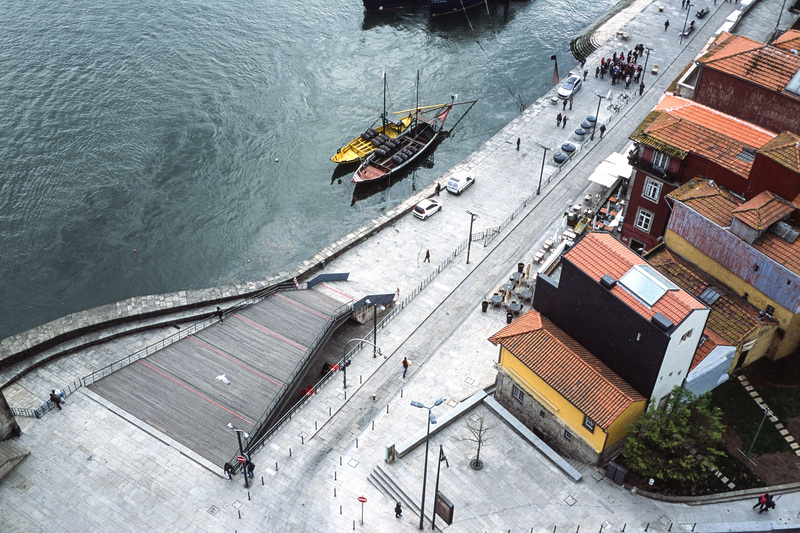 A view of Ribeira, Oporto. 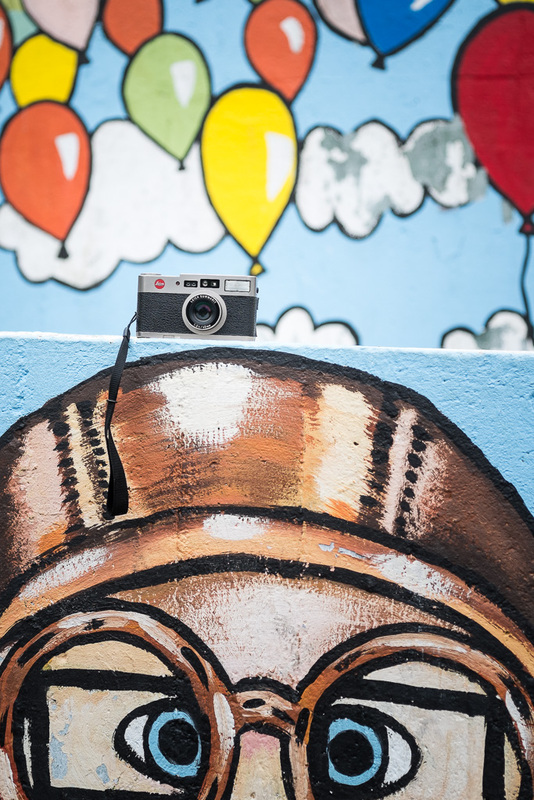 Leica CM loaded with Agfa CT Precisa 100 – Scanner Nikon Coolscan V ED. Click the image to see a full size enlargement. Some my argue that it is not wide enough nor it is a normal lens, to me it is perfect because you don´t get the freaking perspective distortion of the wider lenses but still can get the benefits of one. I have also used the very reputed Panasonic 20mm f1:1.7 lens for the m43 digital system and I may say that the reason it is so popular comes from the fact that it has the equivalent angle of view of a 40mm lens on a 24x36mm frame. To my eyes 40mm lenses just have something special about them. 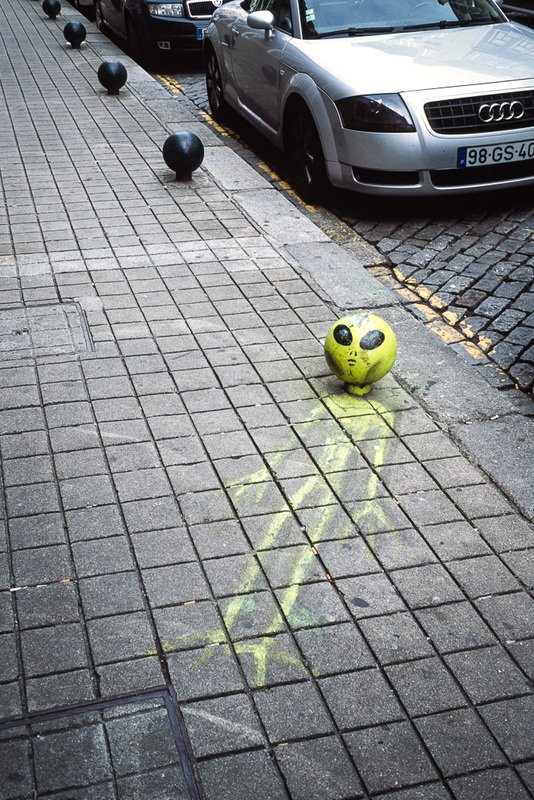 See, I still dream about a Olympus M1 body plus the Zuiko 40mm lens…back to earth. Leica also claims it has better coatings than the older Minilux lens, but this may sound better in paper than it is important in real shooting situations I think. Nevertheless the lens is stunning. But remember, this is a auto-focus camera, in fact a very slow auto-focus camera but still good to me. Maybe a SLR user will find it slow but if you are used to manual focusing cameras it is faster than one. It´s not an important issue unless you do sports photography or so. My only complaint is that the focusing window is too big and sometimes I don´t know if it is focusing where I wish it to focus, but usually it is where it’s supposed to be unless the subject is badly lit or there is not enough separation between the subject and the background. My baby girl at the hospital, I took a series of photos from this position at 1:2.4 and only a couple came out perfectly in focus. 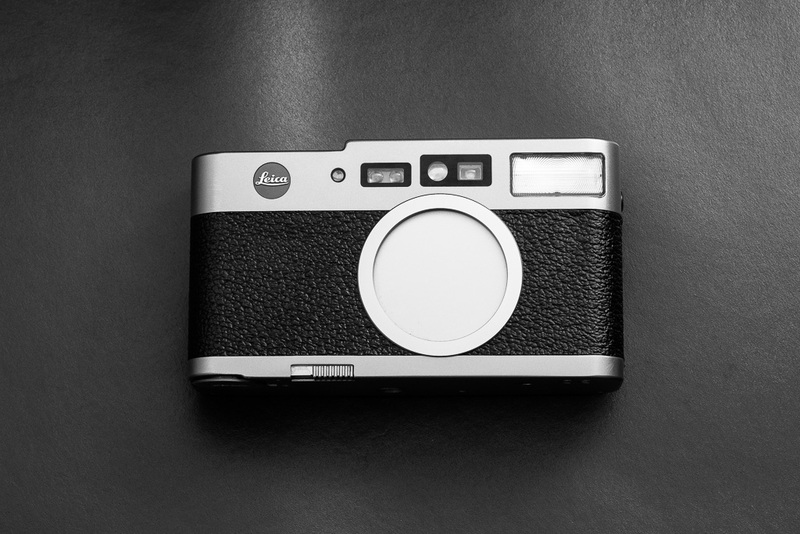 Leica CM loaded with Agfa APX 100. 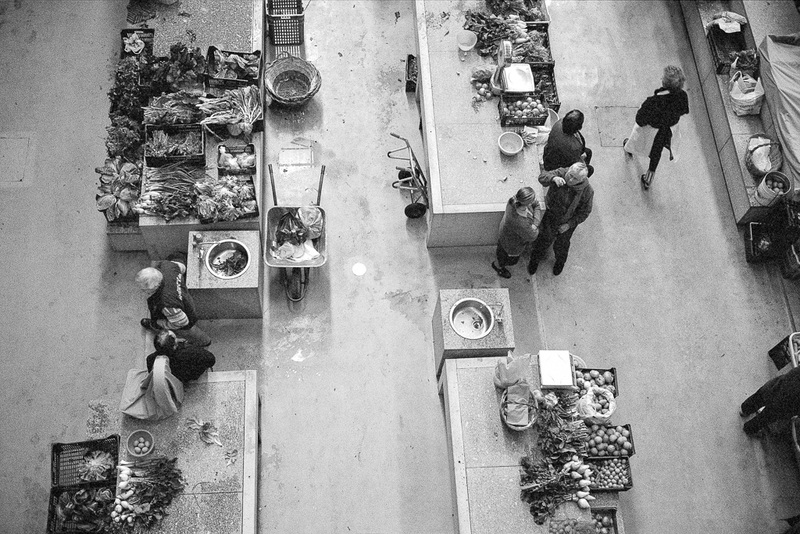 Having loaded the camera with some Ilford XP2 400 film and having used it extensively under bad lightning conditions at the wider aperture, the camera failed mostly always to focus correctly. From 25 exposures 12 came out of focus, maybe it is just me but I suspect that this is not a camera to be used in low contrast light. But again, it is a point&shoot camera, cannot expect the accuracy of a Leica R8/9 body and manual focusing. Very important! The lens does not accept filters neither a sunshade but you can always DIY a solution. Also, I have seen lots of complains about the viewfinder window but I cannot agree much about that, not that it is good because it is not but if you look at the physical size of it, something like 6mm per 4mm in height, it is hard to believe that one can see through it, for me it is an engineering feat. Remember, this is a P&S camera and anyway, it is always possible to add an external viewfinder to the hot shoe. Problem solved. I must add a note here, some people have said that the cameras does not accept any accessories on the hot shoe besides a flash unit. Well, before I got it repaired that was true, if I tried to place any accessory on the hot shoe it would give me a error. Now I don´t have any problem on mounting any accessories on the camera. May this be a sign of a faulty camera before it breaks down? 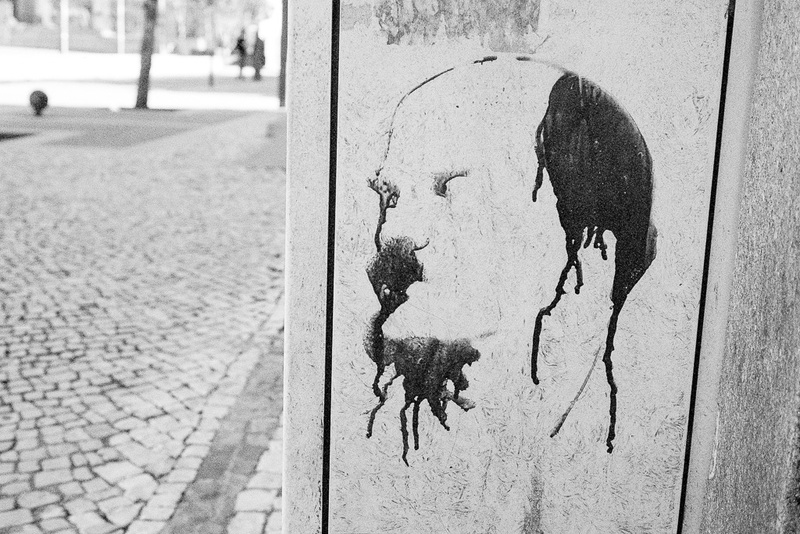 Somewhere in Oporto. 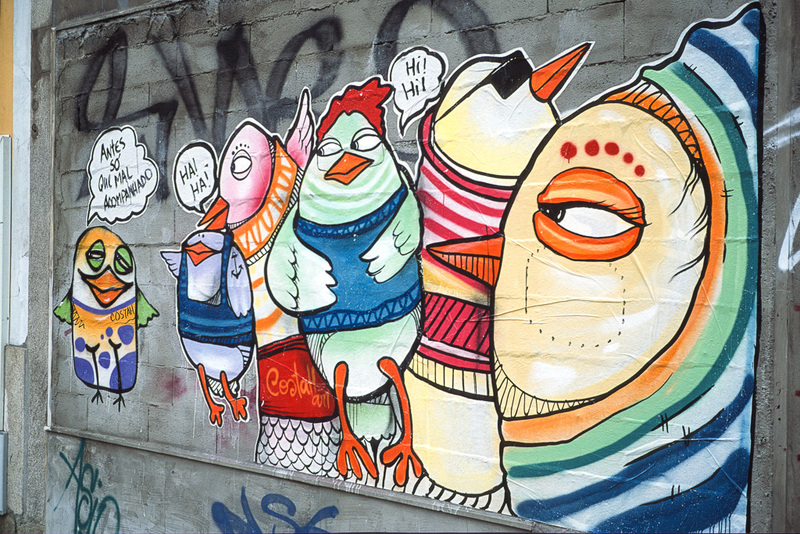 From the same roll of Agfa CT Precisa 100. To sum up this is definitely a flawed camera but at the same time a wonderful piece of photographic equipment. 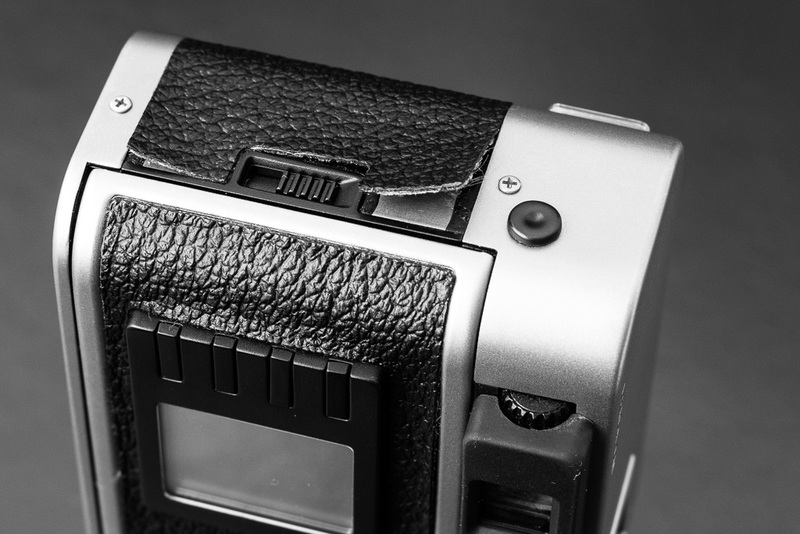 Note that the Rollei 35 SE was a compact camera with only scale focusing capabilities but it is still today one of the most exciting photographic devices and it had other serious flaws! The CM is not the best compact camera one can get but I doubt anyone would refuse it´s ownership. I know at least one person that will not part from is CM. A very nice camera and I hope it does not break again soon. What is so great about this camera, more than how it looks gorgeous is the size of it, I mean the size of it with such a good lens. Barely the same size of my iphone 4 but fatter of course. It is also lightweight and with the lens closed into the body it fits well a jacket pocket so one can take it anywhere. It is such a practical camera in this respect that lately I take it more often out of the closet then I do with other cameras. It is also a very silent camera, the shutter sound is barely noticeable being the film drive the most audible sound but nothing serious really. I was almost ending this review (I started in January), when a friend asked me why I din´t have a Deadcameras strap for the CM. Well… he was right so here it is. If you have a small camera like the Nikon 35ti, Contax T2, Leica CM or Minilux, you can purchase one of these wrist straps here. For any question or just to warn me about a typo mistake, please send me a message to deadcameras@gmail.com.